Hardee County Farm Bureau is actively involved in activities that support our youth such as Ag-Fest and the county fair. For over 25 years, Ag-fest provides a hands-on, interactive experience in local agriculture. Stations are set up to teach fourth graders what agricultural ventures are located in our area and allow them to get up close and personal with local farmers and ranchers. During the county fair, livestock and citrus exhibitors are given shirts donated by the board to show support for all 4-H and FFA is doing to teach youth the value of agriculture. HC Young Farmers & Ranchers build garden beds and deliver garden supplies to 4-Hers who are interested in growing vegetables in the spring as a project. 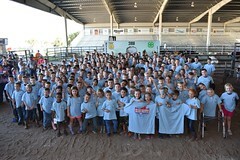 Hardee County Farm Bureau donated shirts to all the livestock and citrus fair exhibitors. Hardee County’s main agricultural products include but is not limited to: watermelons, cucumbers, cattle, honey, and horticulture.